In Māori tradition, Hineteiwaiwa was an atua associated with pregnancy and childbirth. She was also linked to harvesting food and weaving. In the Māori world view, all living things were related by whakapapa. The original ancestors were Papatūānuku, the Earth mother, and Ranginui, the sky father. There are varied traditions about the first woman to give birth. In one story Tāne, the god of the forest, formed Hineahuone from earth, and she gave birth to Hinetītama. Another important ancestor was Māui. He was said to be stillborn and his mother wrapped him in her hair and threw him in the ocean. His grandfather found and tended to him. Some say his mother Taranga miscarried. It was important for tribes’ survival that women gave birth. If a woman could not have children, special karakia were said over her. Women gave birth in specially built shelters. After the birth the shelter and all the things in it were burnt. 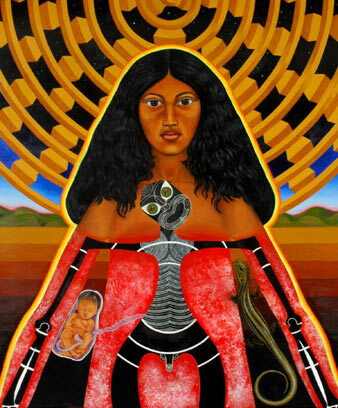 The whenua (placenta) and umbilical cord were carefully placed in tribal land. When the baby could roll over, the tohi ceremony was performed by a tohunga, who sprinkled water over the baby. In the ‘pure’ ceremony, karakia were recited. After this the mother and baby returned to the tribe. Mothers and others in the whānau sang oriori to their babies, lullabies which told whakapapa, legends and tribal history. When mothers no longer needed to breastfeed their babies, they would sometimes smear their breasts with bitter kawakawa sap. In the 19th century few Māori women gave birth in hospital; in 1937 only 17% of Māori women did. In the 21st century most Māori babies were born in hospital. In 2015, 28% babies born in New Zealand were Māori. The Māori incidence of Sudden Infant Death Syndrome (SIDS) is high. Between 2008 and 2012, 100 out of 162 infants who died were Māori. One initiative to reduce this number is a revival of a traditional woven basket for babies to sleep in, called a wahakura. Parents can still sleep with their babies in the traditional way, but the baby has its own space in the basket.